Choosing a new form of travel luggage is a big investment. You need this travel gear to be reliable, comfortable and to keep your items dry and safe. With more models than iOS updates, it is daunting when it comes to choosing between a rucksack with wheels, backpacks with straps only and convertible hybrids cases. 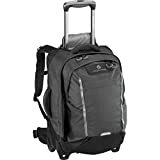 This review will discuss the pros of taking wheeled backpacks on your trip, the differences between the best rolling backpacks on the market and, as a wee backpack bonus, a look at the option of adding detachable Wheels for backpacks. Should you Buy a Rucksack with Wheels? 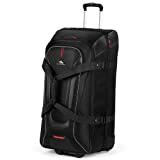 Osprey Packs Sojourn Wheeled Luggage, Flash Black, 60 L/25"
22" x 14" x 9"
32.0" x 16" x 15.5"
22" x 10" x 16"
22" x 14" x 8"
* The most common cabin bag size for U.S and European airlines is 22″ x 14″ x 9″ – be cautious of size when bag is full. I’m a UK native so the term backpack tends to lean towards a day bag and rucksack is reserved for the big 40-80 litres you go backpacking around South America with. My American friend advised me that rucksack is used to describe army style bags and backpack refers to a UK rucksack. For this review guide, the terms backpack and rucksack will refer to a bag that goes on your back which includes straps. The size of bag will determine what type of traveller is suited to the item. A suitcase, naturally, comes with wheels, a retractable handle and is mostly used by holidaymakers who tend to stay in one or two locations during their vacation. Today, the lines between suitcases and rucksacks are becoming blurred! 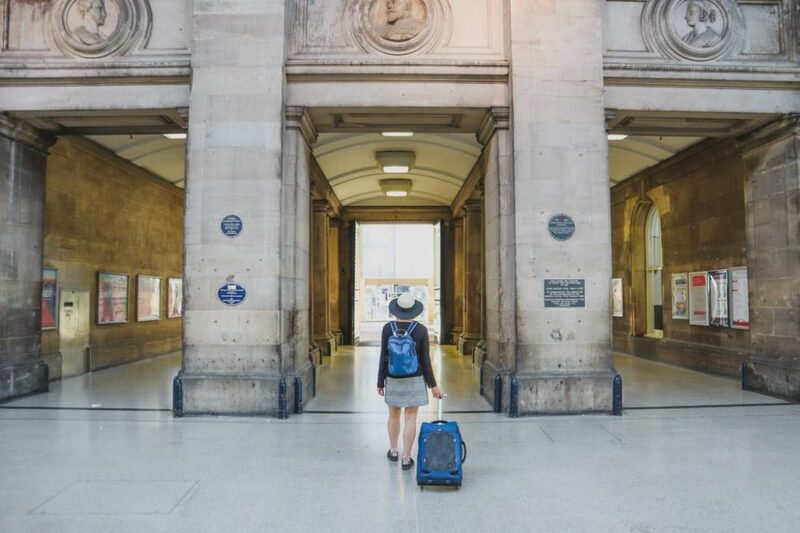 New designs have crafted a rucksack and suitcase fusion where bags unzip like suitcases and have wheels to make transitioning between transport and accommodation easier. For my second backpacking trip back in 2011, I bought a rolling backpack and it ended terribly! I was doing a West to East Coast USA group camping trip and by the time we had reached New York I had lost straps, the retractable handle was hanging on for dear life and one of the wheels was a bit wobbly. My issue? I cheaped out. I picked up a $50 rucksack with wheels at a budget luggage store after enviously checking out my friend’s wheeled backpack which she had spent a few hundred on for a trip to Australia. Moral of the story? You get what you pay for. The best-wheeled backpacks can be three bags in one! Many have the hybrid backpack and suitcase option plus a day bag. The best quality ones have adjustable and supportive backs, durable fabric which won’t tear off as the result of being thrown into the back of a bus multiple times and sturdy wheels that can cover a variety of terrains. A wheeled backpack avoids having to swing 15kg+ on over your shoulder every time you move between destinations. 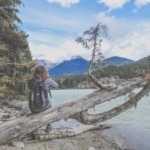 They look great – this suits travellers who are doing a mix of hostels and hotels; believe me, I was not comfortable being the only tourist at Avanta Resort in Florida with a dirty rucksack! When you are on the road for a while you will want some luxury in your life and when luxury hotels in Koh Samui are as little as $30 a night, why not?! Airports and backpacks are annoying. That inch by inch movement to get to the front of check-in involves dragging your backpack without wheels along the ground and then there is the spaghetti fight with the straps at the luggage drop. Rolling bags let you carry a day bag and wheel the bigger bag. When there is awkward terrain and there is a call for no wheels (like a lack of paved roads in some areas of Colombia), travellers can use the bag as a backpack. In cities, travellers can switch between rolling and backpack when there are crowds or cobbles. Wheeled rolling bags are heavier. For example, the most popular wheeled backpack creator, Osprey, has a rolling rucksack coming in at 2.16kg compared to their rucksack without wheels, 0.83kg. Naturally, you can’t take the wheel-less bag for a spin, you are responsible for carrying the full weight on your back. First up, you want the materials of the rucksack to be strong, durable and to function as a backpack when it’s on your back and a suitcase when it is being wheeled. In both instances, you need the material to be water resistant and somewhat wipe proof (you will just have to accept that airlines have no respect for your baggage regardless of how much you spent on it). It has to be breathable too. The zip tracks and pulls should be sturdy as well as the telescopic/retractable suitcase style handle. A strong wheel frame is obviously required and good stand to stop the bag falling over when upright. The majority of the rucksacks discussed in this review are made from nylon which is a strong, durable material which wears well. Hopefully, your travel wanderlust doesn’t end with one trip, so you want your rucksack of choice to last longer than your tan. This is when durability comes in, which has a knock on effect from the materials used and how the bag is structured too. Keep your bag in good health by avoiding packing full to the brim and letting it air when possible. Try to keep dirty shoes in a separate bag inside the case or attached to the outside. The size of the bag really is up to you. If you are a light packer or shopping for a long weekend bag with wheels jump to the air travel section. 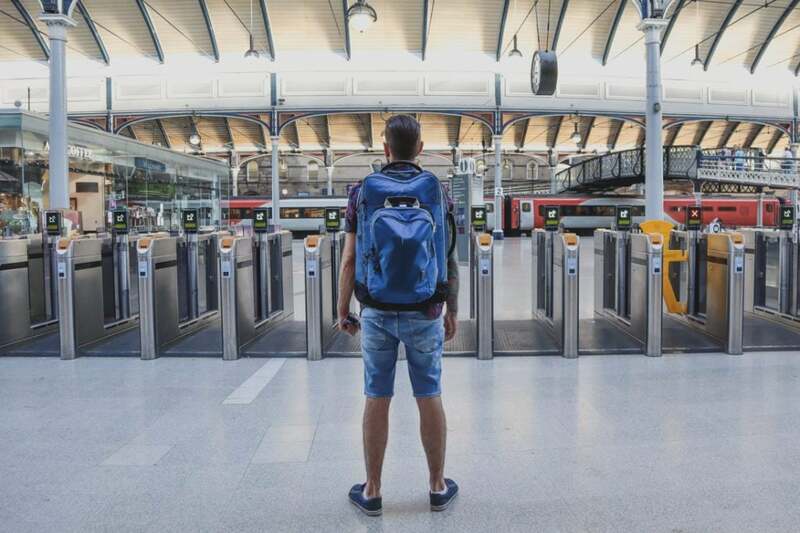 If you are taking a long-term travel trip, don’t miss the first section of the review which looks at rucksacks from 40l-80l. Please be aware that the wheelhouse and structure creates additional height to already large bags so an 80l wheeled bag feels bigger than an 80l bag without. The IATA dimensions for carry-on bags are 22″ x 18″ x 10″/56 x 45 x 25 cm. When comparing the backpack sizes to this standard measurement remember that if you pack it full, it might go over the stated sizes below and that most airlines actually have tighter restrictions. Unless you are lost, or you choose to hike with one of the larger rucksacks, it is unlikely that you will be wearing a rucksack for more than an hour or two. However, the high-end brands such as Osprey and Eagle Creek have put a lot of thought into the comfort of the design, especially around the back area. The better brands will offer an adjustable back structure to cater for different heights. The lower back section of the bigger bags should have a slight bend at the lower back too and flexible material should allow for movement. As mentioned above, breathability and padding is always a positive indication of a good bag as well as adjustable hip and chest straps. A final factor to consider is the comfort of the wheels against your hip when wearing it as a rucksack. Aesthetics are very important to me. If I am investing in an expensive piece of kit I want it to look good as well as feel nice and fit my clothes and electronics. Would I choose a different colour if it was on sale? Possibly! I prefer dark colours to avoid getting dirty too quickly (lesson learned after buying a light grey IT suitcase) although the brights are easier to find on the conveyor belt. According to a trained travel rucksack fitter, Osprey is the ‘Apple’ of the backpack world. I was surprised that this was the comparison, expecting Mercedes to be used but we live in changed times! When you first put on an Osprey backpack you will feel the difference to other makes. Osprey Sojourn 60L/25 measures in at 25l x 14w x 14d inches x 64l x 36w x 35d cms and weighs 3.87kg/8.53lbs. The main material is 1680 Ballistic Nylon. TSA approved one, they are thin enough for most lockers too). Tree Tribe. The dual straight-jacket like compression straps that clip over the front of the back ensure that the zippered away contents are secure. I like how the telescopic handle at the top of the backpack has two tubes (remember my cheap version that broke? You won’t be surprised to hear it only had one tube). This handle has a few height points depending on the desired length of the handle. The backpack has two straps, a hip strap and a chest strap for support – all of which are adjustable. There is also a padded grab handle to the top of the bag for lifting while it is upright and one on the side for retrieving from airport conveyor belts or overheard/under bed storage. The final grab handle can be found on the block that supports the wheels at the bottom of the bag (probably the least useful). The Osprey Sojourn 60L has an adjustable back to accommodation different heights and backpack straps which are supported by a spring-like ‘anti-gravity’ back frame, kind of like a trampoline material. This means it is not only soft and flexible on your poor back but also airy (the sweat struggle is real). These breathable back straps also have load lifter straps for tightening and loosening depending on bag load. The main straps unclip and fold away into the back of the bag which is then zippered away to give a smooth finish. This not only looks good but also prevents the straps for trailing on the ground getting dirty. The wheel structure itself is robust (at the bottom of the bag and a frame built within the back) and the wheeling motion is smooth because the wheels are built high. Most importantly, the wheels don’t get in the way when they are on your back which can be an issue if ergonomically not positioned well. The wheels are on show when worn as a backpack. Meridian and the Ozone (below) members of the Osprey family have a bag built in. Osprey customers are like Canon customers – they commit to the brand after the first taste because they are a backpacking focused brand. However, the Osprey Ozone Convertible has many functions in its favour. Like the Sojourn, the Ozone has a book-like opening bag (it’s not a top opening which is a nightmare for finding your travel gear), detachable straps that fold away in a matter of seconds, adjustable hip/chest straps and easy access top pockets. The winning function of the Ozone is the detachable day bag which is attached by zip. The straps have the same breathable material as its large backpack and a chest strap. What stands out against competitors is the cool option to slide the day bag over the telescopic handle if your back needs a breather or you want quick access to the day bag. The daypack has an organiser pocket at the front for paperwork and stationery (I tend to advise not putting your passport in the front of your bag when in transit though) and a second zippered section behind that before getting to the main part of the day bag. At the back of the main section, there is a padded sleeve for electronics. Annoyingly, the interior colour is the loud, garish green that is used in the insides of the big backpack too. Osprey Ozone Convertible 75L/28 is the larger version, also only available in the U.S. This is the lightest medium sized backpack with wheels. High Sierra AT3 and the AT7 have two separate compartments in the main bag which makes sharing a bag easier. The AT7 measures at 32.0 x 16 x 15.5 inches/81 x 41 x 40 cms and weighs 6.3kg/13.89 lbs. The main material is 900 Duraweave. The AT7 can be used as a wheeled upright case, a duffel bag and a rucksack. The High Sierra range looks a little dated in comparison to the Osprey bags, but it does still offer that hybrid functionality with a stable bottom to ensure a packed bag does not fall over. This very much looks like a suitcase which can be worn on your back that was duffel straps. It is very boxy. The case itself opens like a book so no noisy or messy rummaging for items at the bottom of the bag and the dropbottom storage function might be useful for those sharing with another person. The zips tracks are strong. The AT7 has a dual tubed retractable handle for when you are wheeling and the straps tuck away into a compartment and attach to the bottom of the bag with clips. There is no adjustable back frame like the Osprey. There is one grab hand up top which is more discreet than the Osprey but no grab handle at the side. THE BIG STUDENT BACKPACK: The classic JanSport backpack look, with more space & pockets, the Big Student is great for high school & college students. A water bottle pocket & three front zipper pockets means more room for books, snacks, electronics & gear. YOUR EVERYDAY, EVERYWHERE BACKPACK: JanSport backpacks are popular at school for a reason. With colors & style that reflect your personality, room for books, water bottles, laptops & sports gear, your JanSport goes from school to fun as quickly as you do. JANSPORT BACKPACKS: JanSport backpacks are made with durable fabric, zippers & straps, in colors & designs to reflect your style. We stand by our packs for a lifetime, so carry your JanSport on your adventures, knowing we'll replace or repair any breaks. WE'RE ABOUT THE JOURNEY: JanSport is about the discovery of fun, freedom & adventure. From your first school backpack & lunch bag to the messenger bag for your first interview, from running errands to chasing dreams, JanSport gear inspires your journey. WE'RE THE ORIGINAL: JanSport began making backpacks in 1967. From lunch bags to fanny packs to laptop bags, JanSport gear is durable and functional. You'll love our simple designs if you've used packs by Nike, Adidas, Herschel, Kippling, & Fjallraven. 36L backpack by the well-known Jansport comes in at 22 x 10 x 16 inches/53 x 35 25cms and weighs 3kg/5 pounds. The main material is 600 and 4020 Denier Polyester. This attractive bag has foldaway shoulder straps which connect to the bottom of the bag. The two-stage telescopic handle makes wheeling comfortable and the padded grab handle sits at the top. There is a large mesh water bottle pocket the side too. The Driver 8 is double compartment bag. The back section has a padded sleeve which fits 15” laptops. The front section has a pocket for phones and keys which are also zipped away. No frills, this is a backpack on wheels if that meets your travel needs. The Cabin X One is the new kid on the block. The Kickstarter initiated by the Cabin Max team is one savvy looking hybrid case. Measuring in at 22 x 13 x 8 inches/55 x 35 x 20 cm. On paper, this bag meets airline carry on rules however, I had to remove and leave the day bag at home for an EasyJet flight as the case itself was hitting their maximum when packed for a city break (most likely not an issue with other airlines). It weighs 3.6kg/7.94lbs and the main material is 850D Nylon Shell. Not to start on a negative note, the Cabin X One is a very stylish looking bag. The blue version has grey accents in the two grab handles (top and side) and the area where the day bag sits. Like all of the above examples, the case unzips fully. Inside the bag, there is a mesh compartment which is attached to a coat hanger, possibly useful for business travellers, which can be removed. The front of the rucksack has a fleeced sleeve zippered section for electronics which is big enough for large laptops. The retractable handle has one tube but does not move, very study. It only stops at two heights – flush with the bag or extended out to use as a suitcase. The Cabin X One has the neatest of hidden straps sections, there is no stuffing away with this baby. The patent-pending design unzips from the bottom of the strap up and a piece of material at the bottom of the bag pulls out to cover the wheels – none of the other wheeled bags in this review has that function. The day bag is a bit of a letdown for me because it is so close to fitting a MacBook Air 13” (out by less than an inch) which would have made the Cabin X One a perfect short haul travel bag. Nonetheless, if you care about the aesthetics of your carry-on luggage and can live without the day bag for some European flights, don’t bypass the Cabin X One carry-on. The main bag straps are hidden by a zippered compartment which velcros back once the straps are revealed. The load lifting straps are attached already, the bottom of the straps clip on to the bag. There is also a padded hip strap and a chest strap. There are two buckles on the shoulder straps which allows you to attach your day bag to when using the larger bag as a rucksack and for security. There is a loop for small padlocks which can be locked at the central point at the bottom of the bag. It also has ‘finger friendly’ pulls. There are two zippered pockets on the main bag external. The water bottle slot to the side is also zippered away. There are three grab handles, top, side and bottom. The telescopic handle is dual tubed, can be used at three heights (flush, midway and fully extended) and zips away discreetly like the Cabin X One. There is a simple one section storage area inside the main section of the bag with a compression strap. There is also one large zippered mesh pocket for toiletries or for storing dirty clothes. The daypack has a stash pocket and two water bottle slots. Inside there is a padded slot for a 15” laptop, separate sections for smaller electronics like phones and a small area for other items. There is a clear zippered section with a key fob loop too. This smaller bag simply zips onto the larger bag. Another option would be investing in a rolling attachment for backpacks. In all honesty, I’ve never seen this on the road but there are options. Take note of the weight of the bag and frame before booking carry-on luggage trips. Little World IT backpack with removable wheels comes in at 14.6 x 20.9 x 9.8 inches/37 x 53 x 25 cms and weighs 4.25 pounds with the backpack itself weighing 2.1lbs/0.95kg and the frame, 1.8lbs/0.8kg. The main material is Oxford cloth. The backpack has three compartments and is big enough for a 16” laptop and other gear. The shoulders are padded for comfort and there is one grab handle at the top. A water bottle can be stored at the side. The wheeled frame fully extends to 38.2 inches from wheels to handle and is 11.4 inches wide (cms?) – suitable for folding and placing under the aeroplane seat. The one tube handle is made of aluminium. 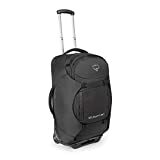 Neewer 2-in-1 Camera Backpack Luggage Trolley Case is an attractive and popular 2-in-1. It is obviously predominantly for photographers but the internal compartment can be removed and use for other travel. It measures 20.8 x 15.98 x 9.8 inches/55.9 x 40.6 x 24.9 cm and weighs 3.95kg/8.71lbs. The main material is Nylon with YKK Zipper. The backpack comes in black, has padded straps and a grab handle at the top. When the wheel frame is detached it can be stored by clipping to the side of the bag. The internal casing (if you are a photographer) comes in an attractive array of colours and it comes with a rain cover. The telescopic handle extends to 21.3 inches/54 centimetres. Deciding which of the above is the best-wheeled backpack for travel is a tough choice to make. The answer really comes down to what capacity of bag your travel needs require, whether you like a day bag, what constitutes as aesthetically pleasing and your backpack budget. The final point I would like to reiterate – don’t cheap out on baggage, it should be an investment that lasts longer than that holiday henna tattoo. Cool gift! I’m sure she’d appreciate it, Anthony. Please see response to other comment. It is exceptionally annoying on this and other websites regarding wheeled rucksacks and this may imply in general to other camping equpment that the measurements are put down early in each review but without defining which is height/length, which is width and which is depth a.This leaves me spending extra time scrolling back up to see e,g on one review at the end when it defines the first measuremnt as lenght/height, the second as width and the third as depth and then scrolling back to the review I am looking at that I am looking at that does not satate whcih measuremnt is height/length, width and depth and relating the measuremnt from the the review which does state such to the one that does. On the Jansport Driver 8 Rolling Laptop Backpack the measeurments are 22 x 10 x 16 inch and 53 cm x 35cm x 25 cm. If you take the second measuremnt in inches and centimetres you will see that 10 inches is a shorter measurment that 35 centimetres and the nthird measurement 16 inches is a larger measurment than 25 centimetres. Please could you supply me witht he correct measuements as regards the bag with handle and wheels included. You can check all measurements by clicking through the product to Amazon.